We had a fantastic and memorable trip, and enjoyed each place we visited. 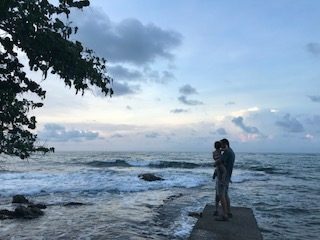 Although we traveled comfortably, we felt like we got a sense of the real Costa Rica and not some generic resort version of the country. Luis was knowledgeable, personable, and patient, and his advice about activities and pacing was spot on. 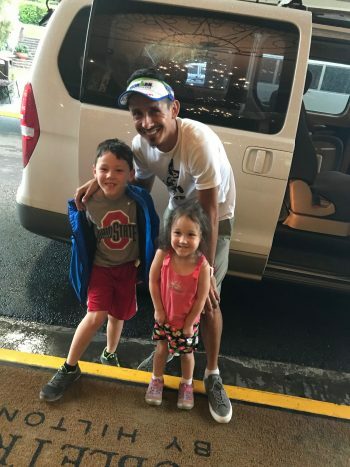 We especially appreciated the flexibility and ease that came having Louis, we could adjust based on weather and how the kids were holding up, and we didn’t have to argue about directions! 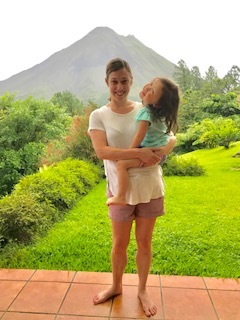 The people of Costa Rica were so warm, friendly, and welcoming to tourists. The place we have visited in our lifetime that compares in this regard is perhaps Istanbul, Turkey. Thank you so much for organizing a wonderful trip! I appreciated the detailed comments of others on your site so I will try to put some of my thoughts below. We arrived to our San Jose hotel around two in the afternoon and decided to take an Uber to Zoo Ave. It proved to be a good introduction to the many animals and plants we would see on the trip. We had to take a slightly more expensive taxi back without wireless, but the zoo called one for us and it worked out great. The Monteverde area was beautiful. We loved the Arco Iris Hotel and did the El Trapiche tour as soon as we arrived. 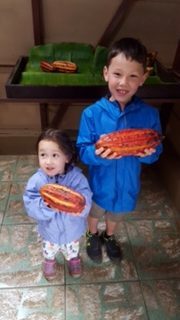 It covered sugarcane, coffee, and cacao in one tour that was a good length for the kids. The treehouse restaurant was a hit for dinner! 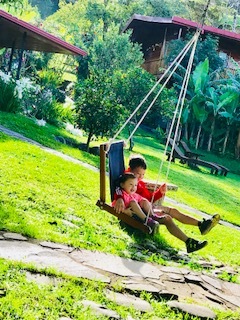 We enjoyed the Monteverde preserve the following morning, but perhaps the canopy hanging bridges even more in the afternoon. We decided to take the bus / boat route to Arenal. It was fun but we were so glad Luis was driving the luggage, it would have been a rough trip through the mud to the boat with suitcases! I was also glad I remembered enough Spanish to get us on the right bus after the boat ride! 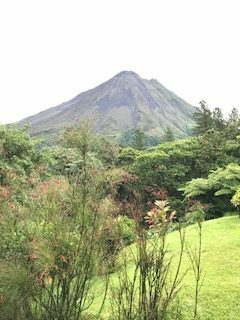 The Arenal area was perhaps my favorite spot of the trip. We got a gorgeous glimpse of the cone for just a few minutes while we were at the hot springs on the day we arrived. 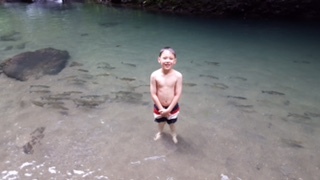 La Caterata hike / swim was a must do, though my husband took the brunt of carrying our three year old back up! 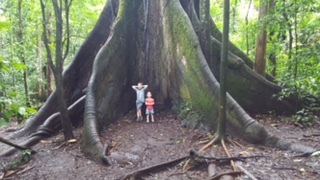 We didn’t have great views during our time in the national park, but the lava and Kapok tree still made it a memorable hike. We also found walking through the stages of re-forestation fascinating. We also enjoyed the Danaus wildlife refuge in the afternoon. We absolutely loved the Observatory Lodge, and as the clouds parted on our final morning there we excitedly scrambled to get dressed and take pictures. 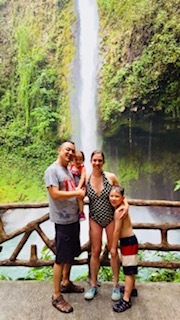 We had a great hike around the lodge property with Luis to another waterfall the morning we left. It was here we finally saw monkeys, and Luis even paused to photograph the baby toucan we saw! Sarapiqui was fabulous as well. We slept really well in the La Casona apartment, and couldn’t believe we were fortunate enough to have a washer and dryer here right in the middle of our trip. One load each night and we were good to go for the rest of our trip. The staff here was incredibly friendly and helpful, they made you feel like family at meals. 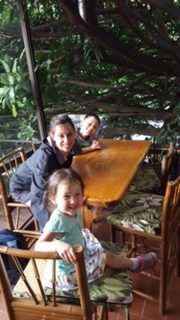 We did the Pineapple plantation, this ended up being a private tour, and we had the best pineapple we have ever tasted…like butter.) We also did the Green river rafting (float), and Tirimbina. We saw howler monkeys and bullet ants here. We highly recommend all of the above. 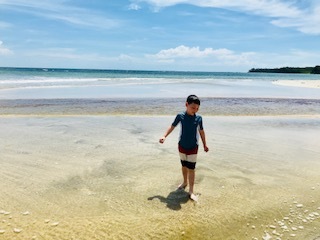 The last stop on our trip was Cahuita. It was not busy this time of year, and during our stay at El Encanto we were the only ones there for some of our stay. The hotel grounds were very relaxing and pretty, though the way everything is gated off we could not hear the ocean. (I might have splurged on something oceanfront had it been an option.) We were glad we decided on the AC here! One small thing we didn’t love was the Pitt bull roaming around the property…though it was friendly, it made us a little nervous with our three year old. Cahuita National Park was idyllic, but the town itself was a little more dead/ run down than we expected. Some of the restaurants (including Sobre Las Olas ) were closed for a few weeks, and Tree of Life is closed indefinitely. We enjoyed Edith’s, and my husband (who had been deprived of spicy food) even got Edith herself to go back in the kitchen on the second night to cook a spicy Jamaican pork chop! We visited both the sloth sanctuary and jaguar rescue center. We enjoyed these but left with mixed feelings about these places in terms of their philosophy. Our one somewhat rough day on the trip was when we got stranded for a couple of hours outside of Puerto Viejo, as the police had set up a stop and none of the taxis would come after our time at the rescue center. A sweet lady at a fruit stand was finally able to get us a tourist van to pick us up legally, and we were grateful as the bus wasn’t supposed to pass by for another half hour. 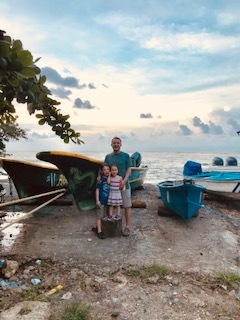 We still had an enjoyable and relaxing time here (though we aren’t very good at sitting still) and were glad we got to experience the very different culture of the Caribbean side of the country. Before heading to the airport we toured the National Theatre which I enjoyed, and took a peek in the national cathedral. 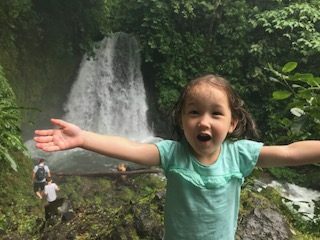 Overall it was one of our favorite trips, and by far the best family adventure we have done with our two kids. Thanks to you and especially to Luis for everything. P.S. One more thought that might be helpful to others as an addendum to yesterday’s email. I made the mistake of checking weather on my phone the night before we left, and from the looks of the weather apps it seemed like it would be pouring all day every day. Don’t panic! Though we had rain, much of it was at night, and we found that the clouds in the afternoon actually made it possible to hike longer than we would have otherwise. I would not hesitate to go again during the rainy season!